October 12, 2003 Smoldering bonfires from Hurricane Isabel debris are now drenched with Autumn rain, filling the air with the smell of wet ash. The Cherokee crew rolls right along with interior woodworking. 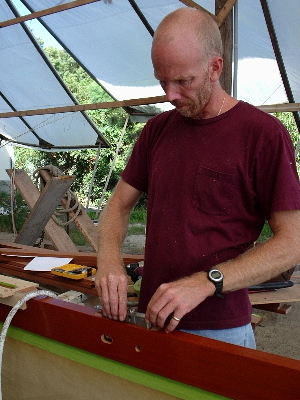 Tom Parker finished hanging doors in the stateroom, guest rooms, and heads after installing locks. 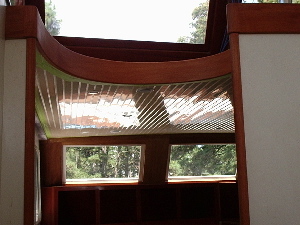 Tom also finished up the trimwork along the console and entryway to the galley area. Just before the hurricane, Eamon Connelly – a Bostonian (love that accent) and specialist from Vector Controls – flew in and worked out a few kinks with the steering system. Then the crew went for a mini shake-down cruise along the Straits. The Cherokee was amazingly smooth, cutting through the choppy water as if it were slick ca’m, just like the Cedar Island ferry. 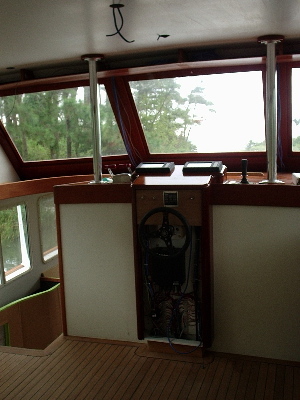 Leonard and Chris installed the original hand rails to the Huckins. 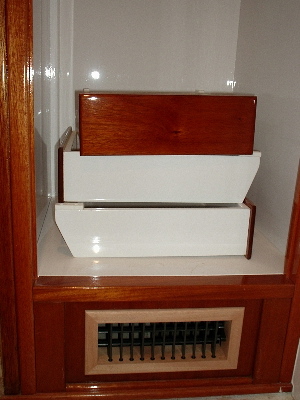 Chris glued up the wainscotting, and installed air conditioning vents such as the one depicted below. Pretty! 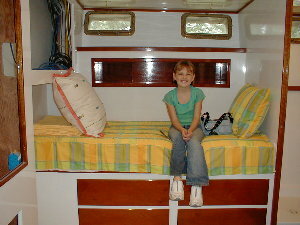 Ms. Syndey Jane Wise, age 8, agreed to model some of the new linens and bedspreads that were made up in preparation of the Darden’s first solo trip to Cape Lookout. 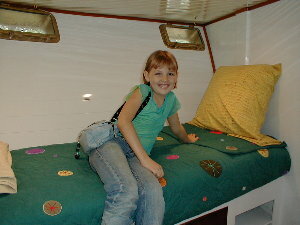 Below left is the aft guest stateroom, which of course has a matching bunk across the way and a head with toilet and sink. 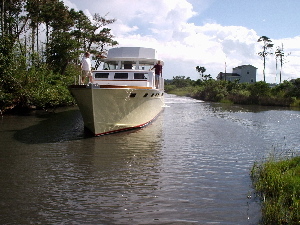 To the right is the V-Berth. 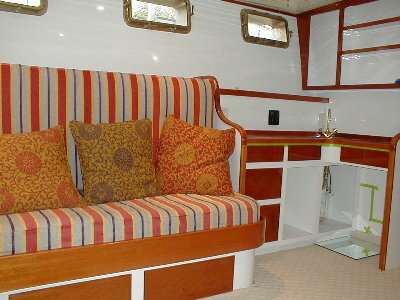 Here’s how the master stateroom is shaping up. 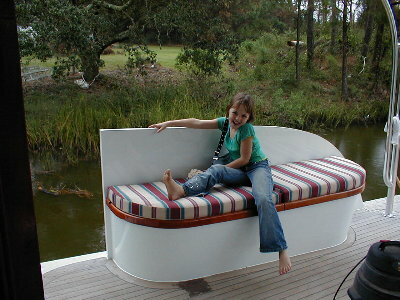 This sofa converts to two pilot berths (i.e. bunk beds), across from the double bed. Impressed with the color scheme? Thank interior decorator Catherine Williams. Here’s Syndey relaxing after an exhausting modelling session (she was paid in greek olives and humus – she said it was almost as tasty as her favorite snack – pickled ocra.). Note the freshly cushioned deck bench. Yet to be installed is the wing door that will be to Syndey’s right, our left.